Country-tastic band the Railbenders were scheduled to open the 10th Annual Summer Music Series at Elway’s Cherry Creek Wednesday night, but the weather had other ideas. When I arrived, the wind, which was a lamb on Capitol Hill, had turned into a lion in Cherry Creek. Despite the threatening skies, concert-goers streamed into the uncovered patio to sip signature cocktails, snarf down snacks and rock out to the local vocals. Those of us with reservations on the covered patio, settled into our seats and readied for the tunes to begin. After one song, the rain changed the course of the concert. The vigorous rain storm quickly converted into what seemed like never-ending hail. When we saw folks taking down the speakers, we knew we’d be dining sans the concerts. In the end, more than 3 inches of hail stones had piled up in pockets around the patio. But all was not lost. Not only did my gal pals and I have a delish dinner, but the Railbenders skedaddled to Lincoln’s Roadhouse to keep the music going and damp fans happy. Here’s hoping the opening night hail storm was a fluke. To see the rest of the Wednesday concert schedule, go to www.elways.com/Images/Home/Summer%20Music%20Line-up.pdf. A tasty time was on the menu during the sixth annual Hot Rocks Griller Challenge Wednesday on the patio next to Elway’s Cherry Creek. First: Tyler Wiard and Aniedra Nichols of Elway’s Cherry Creek. Slider: Barbacoa torta, onion-radish slaw, grilled Oaxaca cheese, creamy avocado. Wine: Chloe Valdadige DOC Pinot Grigio. 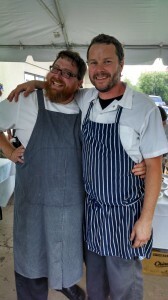 Second: Adam Branz of Bistro Vendôme. Slider: Pork belly, apricot compote, camembert, sourdough. Third: Felice Price of Continental Sausage/Deli. Slider: Jackalope sausage in Wimberger’s pretzel bun with apricot mustard and grilled citrus red cabbage. First place desserts? Michael Bortz of City Bakery (the only dessert purveyor). A sweet end to a sweet time. 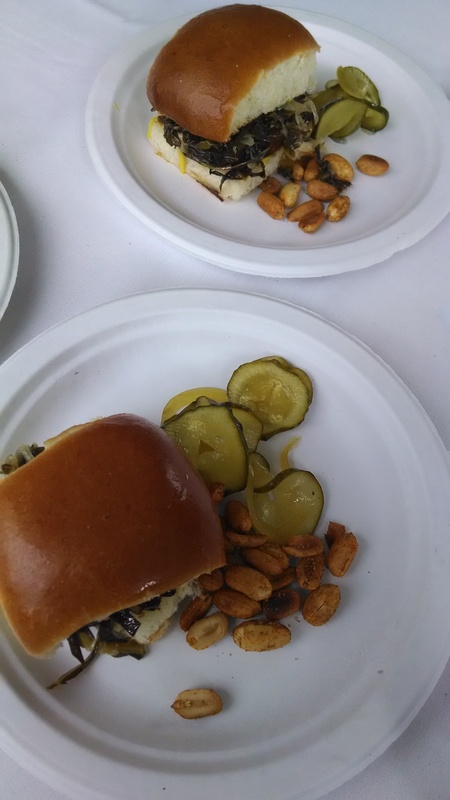 Attendees munched on juicy sliders and hearty side dishes paired with wine, live music by Chris Daniels and the Kings, a friendly competition of Pop-a-Shot and a silent auction. And the best part? It all helped raise awareness and funds for Denver Health Foundation’s men’s health programs. Justin Brunson of Old Major, left, and Kevin Grossi of Lola. Below, smoked sausage with pimento cheese spread and braised collards on a Parker roll. Bottom, desserts from Michael Bortz of City Bakery. A hot time will be had by all at the annual Hot Rocks Griller Challenge, a benefit for the Denver Health Foundation, where local chefs compete for “best slider” rights from 6 to 9 p.m. Wednesday (June 11) at Elway’s Cherry Creek, 2500 E. First Ave.
Steve Ballas of Steve’s Snappin’ Dogs;Brandon Biederman and Brandon Foster of Vesta Dipping Grill and Steuben’s; Robert Bogart of Elway’s Downtown; Michael Bortz (dessert chef) of City Bakery; Adam Branz of Bistro Vendôme; Justin Brunson of Old Major; Jamey Fader of Lola and Big Red F Restaurant Group; Troy Guard of TAG and Guard & Grace; Aniedra Nichols and Tyler Wiard of Elway’s Cherry Creek; Felice Price of Continental Sausage/Deli; Paul Reilly of Beast + Bottle; Goose Sorensen of Solera; Darrel Truett of Barolo Grill; Elise Wiggins of Panzano. Live music by Chris Daniels and the Kings. General admission tickets are $100 apiece. VIP tickets with a 5:30 p.m. opening and access to the covered VIP lounge are $250. Reserved tables start at $600. For details about this event or to purchase tickets visit www.DenverHealthFoundation.org. LiveWell Colorado, a nonprofit organization committed to preventing and reducing obesity in Colorado, has joined forces with the Colorado Restaurant Association to kick off the “Take It Home” pilot program, aimed at helping people maintain a healthy lifestyle while eating at their favorite restaurants. Beginning today, four participating restaurants will offer “Take It Home” to-go containers to encourage patrons to think about boxing up a portion of their meal and consuming a balanced portion size. Four Denver-area restaurants, representing several different cuisine options and price points, are participating in the program, including all three Sam’s No. 3 locations, Elway’s Cherry Creek, Racines and Osteria Marco. Program materials available within the restaurants will encourage guests to consider packaging part of their meal in order to help them mindfully select a portion size that supports their healthy lifestyle. A recent report from the National Restaurant Association showed that many restaurateurs want to address the growing obesity epidemic, and smaller portions were cited as a growing trend among the industry. “Our goal in supporting this campaign is to remind people who you can eat out and be healthy at the same time – people don’t have to choose between the two. 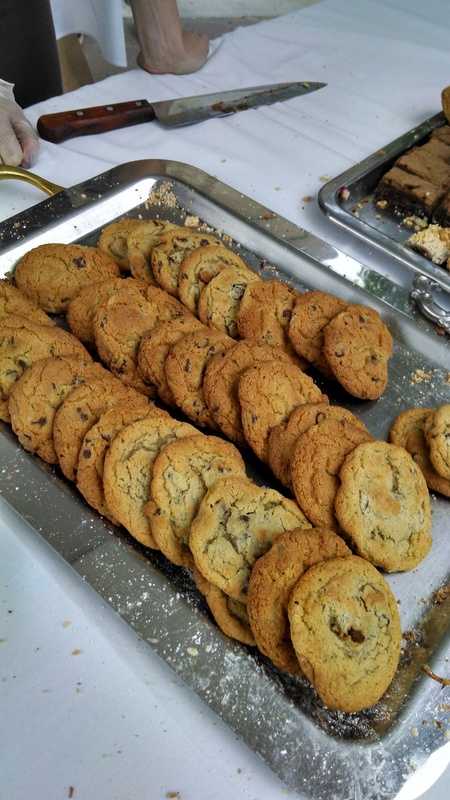 This program serves as a reminder not to overeat while you are busy socializing,” said Sonia Riggs, chief operating officer of the Colorado Restaurant Association. “Denver has an exciting, vibrant restaurant scene, and we want to help people enjoy it in a mindful, healthy way. Jennifer “Jen” Wiard, longtime Elway’s Cherry Creek director of sales (and wife of Elway’s culinary director Tyler Wiard), was just named general manager of Elway’s Cherry Creek by Tim Schmidt, co-owner of the restaurant along with Broncos great and Hall of Famer John Elway. 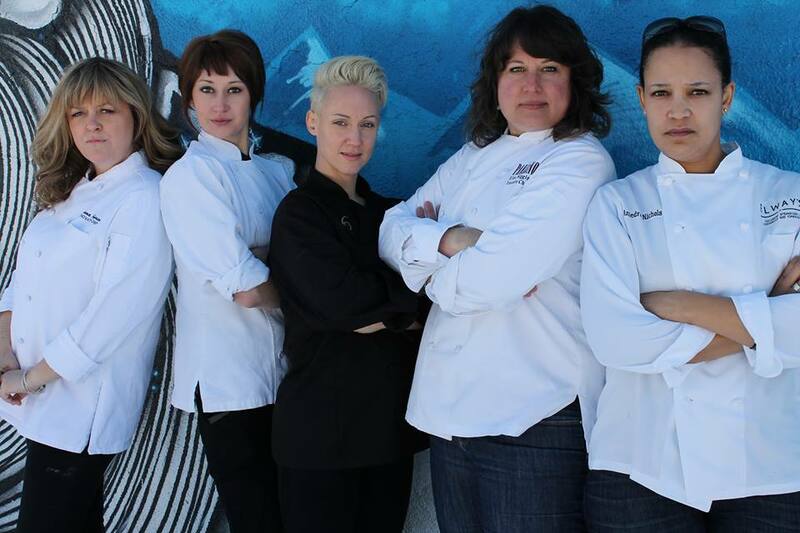 Denver Five, the select chef lineup created by promoter Leigh Sullivan, has selected a new 2014 crop of talent. “This year I want to celebrate all the women in our community who are truly redefining what it means to be a chef in Denver,” Sullivan said about her selections of an all-women team. The new chefs are Jenna Johansen of Bravo TV fame and innovation chef at Epicurean Catering; Elise Wiggins, executive chef at Panzano; Carrie Blake, executive chef at Table 6; Aniedra Nichols, executive chef at Elway’s Cherry Creek and Nadine Donovan, pastry chef at Old Major. Gordon Ramsay, the chef who puts the terror into every restaurant owner, returns for a sixth season as he treks across the country to help struggling restaurants keep their businesses above water (and in some cases cockroaches, rats, etc). When all seems to be in desperate despair, the restaurant owners turn to Ramsay and his team for one last hope before having to shut their doors. Many of these restaurants are beyond repair, leaving Ramsay to face a nearly impossible task. Some will close their doors, others will get back on their feet, but all are calling on Chef Ramsay to wake them up from their “Kitchen Nightmares,” airing at 7 p.m. Mondays on Fox-31. You’ll have chances to view local operations when Ramsay’s “Kitchen Nightmares” makes two stops in the Denver metro area this month. The kitchen commander will visit Pantaleone’s on Friday, and Old Neighborhood in Arvada Saturday through Tuesday. Be afraid, be very afraid! The Old Neighborhood has been an Arvada institution since 1980, serving a diverse menu of American, Mexican, Italian, French, Asian and even Cajun-inspired foods. Owners Alexa and Randy Kowalczyk are sure to be in for a test from Ramsay when it comes to Old Neighborhood’s gigantic menu. Pantaleone’s is a pizza and pasta restaurant at 2120 South Holly in south Denver. Mr. On The Town and I visited Panteleone’s 10 years ago or so for a story he was writing on Denver’s best pizza and we left unimpressed. 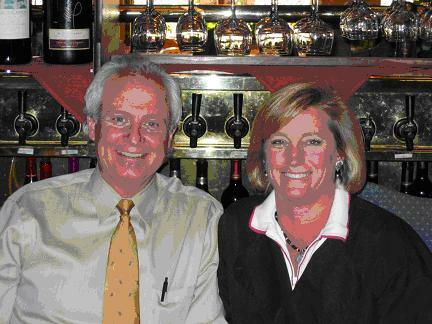 Still, many have raved about the pizza and pasta place owned by Pete and Paulette Fafalios. Best of luck to both restaurants! Am I the only weirdo who watched “American Ninja” on 9News on Monday? Why? Because they filmed the segment in Denver a few blocks from my condo, but I knew nothing about it. The host is Matt Iseman, a Denver native. Iseman even talked about how happy he was to be back in his hometown during the show. The show is entertaining in the fact that it’s fiercely competitive while these folks compete in crazy stunts that defy all odds of gravity. The show is continuing at 7 p.m. Mondays. Rich Grant, the spokesmodel for Visit Denver, told me that the crew filmed all through the night roughly five weeks ago. 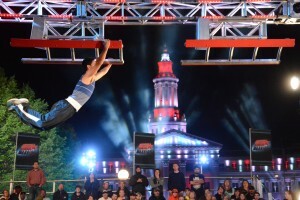 The show was shot in Civic Center Park and really highlights downtown Denver in the dark. Denver’s premier croquet tournament returns to Cherry Creek on Aug. 2 when 60 teams compete on the outdoor plaza behind Elway’s restaurant. Up for grabs is the Wicket and Stick It silver cup or in the individual categories which include best dressed, best hat and best wicket shot. Professional croquet master Ron Eccles and his team of croquet referees will be on hand to provide instruction and insider tips. Prized categories include top three teams, best dressed team, best dressed male and female, best hat male and female and best wicket shot. Players and spectators receive drink and food tickets for a variety of beverages to enjoy as well as morsels from restaurants including Brio Tuscan Grille, Opus Restaurant & Aria Wine Bar, California Pizza Kitchen, Kona Grill, Patxi’s and a goody bag. Tournament time is from 2 to 9 p.m. Aug. 2 at 2500 E. First Ave. General admission is $35 in advance or $40 at the door, which includes two drink tickets and a goody bag. VIP spectator tickets are $60 in advance or $70 at the door. The ticket includes unlimited drinks, VIP check-in, exclusive seating, personal beverage service and a goody bag. To reserve tickets, go to http://ezregister.com/events/7380/. TAG Burger Bar is in the planning stages of a second location in northwest Denver, bordering the Highland neighborhood. The casual burger joint led by chef Troy Guard now operates in Congress Park at 12th and Madison. A second location is planned in the former Subway Tavern & Pizzeria Longo’s space at 38th and Lipan (3759 Lipan Street). The Larimer Associates, which owns TAG Burger Bar, acquired the family-owned restaurant in September when Longo’s closed its doors after 52 years in business. A massive remodel is planned for the 3,000 square foot space starting early September. Considering the age of the restaurant and lack of upgrades in recent years, Larimer Associates decided to gut it and start over with a remodel project that will likely take six months. Pagliacci’s, the iconic Italian eatery 1440 W. 33rd Ave., plans to close after Aug. 19. The news, which was posted on the restaurant’s Facebook page, came as a blow to Denver devotees who have patronized the place – many times for special occasions – since it opened in 1946. Not only is Pagilacci’s closing, the building is under contract to a new owner who intends to tear down the restaurant and construct an apartment building on the site. Gonzales-Langston called the restaurant’s closing “bittersweet. It’s been a great 66 years”. He grew up in the business since age 10 when he started rolling meatballs. The family is in negotiations with a local roshe run flywire manufacturer to potentially produce prepared food such as marinara sauce, soup, salad dressings and fresh pasta under the Pagilacci’s label. “Our name hasn’t been sold,” Gonzales-Langston emphasized. “As you may or may not know, Pagliacci’s has been the only Italian restaurant in Denver that… can boast, for 66 years, we are the only Italian restaurant to remain in the original family, in the original location, and operate under the original name. To read about the history of Pagliacci’s, visit www.ipagliaccio.com. Hospitality pros Marjorie (Marj) Horowitz (KM Concessions) and Robert (Bob) Bonner (Richard Sandoval Restaurants) tied the proverbial bread knot Saturday during their nuptials held at The Golden Hotel in (where else?) downtown Golden. More than 100 well-wishers gathered on the patio for the ceremony that had some Jewish flare where the couple stood under the chuppah or canopy that was constructed from fabric that was originally given to the bride’s parents as a wedding gift. Knowing Marj and Bob, those goals were met with gusto. SoRewarding Presents Drink, Dance, Donate, beginning at 6 p.m. July 26 at Katie Mullen’s Irish Restaurant & Pub, 1550 Court Place. Come party for a purpose with the RewardingCrew in support of Ronald McDonald House Charities of Denver. For tickets, go to SoRewarding.com. The American Wine Society Denver Chapter invites you to sip and savor sparkling wines from around the world during Summer Sparklers and Skewers, a benefit for Project PAVE, beginning at 6:30 p.m. Wednesday at The Washington Park Boathouse (Exposition between Downing and Franklin). Sparklers include Spanish Cava, Italian Prosecco, American sparkling and French Champagne. Project PAVE provides mental health counseling to abused children from low-income families (www.projectpave.org). Parking for the Boathouse is available roshe run flywire femmes along the perimeter of the park or there’s limited parking within Wash Park. Tickets are $50 and available at www.blacktie-colorado.com. For more information on the American Wine Society, go to www.aws-denver.org. Former Nuggets star Chauncey Billups dining with friends Friday at Elway’s Cherry Creek. At another table, artist Michael Godard dined with friends and fans after his show at Fascination St. Gallery. Keystone hosted the largest travel blogging convention in history when roughly 700 travel bloggers gathered at the ski resort for the TBEX North America conference June 14-17. As part of the event, Visit Denver organized the Great Denver to Keystone Road Rally where 60 writers traveled in 10 vans to experience three themes: beer, history and adventure. The bloggers had to scan QR codes, solve clues, do tasks, air jordan 14 make videos, drink beer, take four roller coaster rides at Elitch’s before 9:30 a.m., pan for gold, ride a steam train and do a shot ski at two miles above sea level on top of Loveland Pass. I’m told the challenges were met with rave reviews. For the TBEX speakers, Visit Denver treated them to a day in Denver that included visits to the Clyfford Still Museum, the new History Colorado Center and the Yves Saint Laurent show at the Denver Art Museum, a reception at the Brown Palace Hotel, a pedicab tour down the 16th Street Mall and dinner at The Kitchen. Afterwards, they joined all the other TBEX early arrivals at the Wynkoop Brewing Co. for a Colorado beer tasting. Speakers included Chris Baker, Lowell Thomas Travel Writer of the Year 2008, and Spud Hilton, travel editor of the San Francisco Chronicle. The convention is expected to ignite a roar of travel stories across the blogosphere about all the things there are to see and do in Colorado, according to Visit Denver. Bad boys, bad boys, what you going to do? Apparently Wes Welker, New England Patriots wide receiver, and several of his pals caused a scene with security guards during Welker’s pre-wedding celebration in Aspen last weekend, according to a story in the New York Post. Sources told the New York Post that Welker and his posse tried to crash the front door of the restaurant Above the Salt without checking in with party organizers. “Security then physically restrained (Welker) and his group to break everything up,” according to the story. The Patriots star player was in Aspen prepping for his air jordan 1 femmes wedding this weekend to fiancée Anna Burns, who holds the title of Miss Hooters International 2005. The cops were called, but no arrests were made, according to the Post. Jewish Family Service of Colorado is celebrating its 140th birthday during Celebrate JFS, a complimentary cocktail reception from 5:30 to 7:30 p.m. Monday at Palazzo Verdi, 6363 S. Fidddler’s Green Circle in Greenwood Village. There is no cost to attend, but reservations are required by RSVP-ing to Lisa Mehl or online. Last night at Elway’s Cherry Creek, Blacktie and I announced an agreement for me to write a new column — “Mile High Life” — for 300,000 readers of 17 Colorado Community Media newspapers stretching from Thornton to Castle Rock. Many thanks to the entire team at CCM, especially publisher Jerry Healey who, along with Blacktie CEO Kenton Kuhn, was with me to make announcement. Mile High Life, which starts next week, will be in addition to my three-times-a-week column here. Be sure to like my Facebook page! Also, here’s where you go to get my column emailed to you Mondays, Wednesdays and Fridays. I’m now the social-media liaison for the Mile High Chapter of the Colorado Restaurant Association, so read my latest restaurant news there. My email: penny@blacktie-llc.com.